A sucker for a Summer dress, I was impressed with the selection of maxi dresses and holiday dresses, like the relaxed grey jersey maxi (you all know how much I love grey! ), the chic black cami dress and the beautiful yellow skater dress, which is available in the curve range. The cute little floral cover up would look lovely worn over any of these, or even as a beach cover up over the gorgeous Melissa Odabash bikini! The thing that impressed me the most about JD Williams though, was the amazing range of Summer sandals. 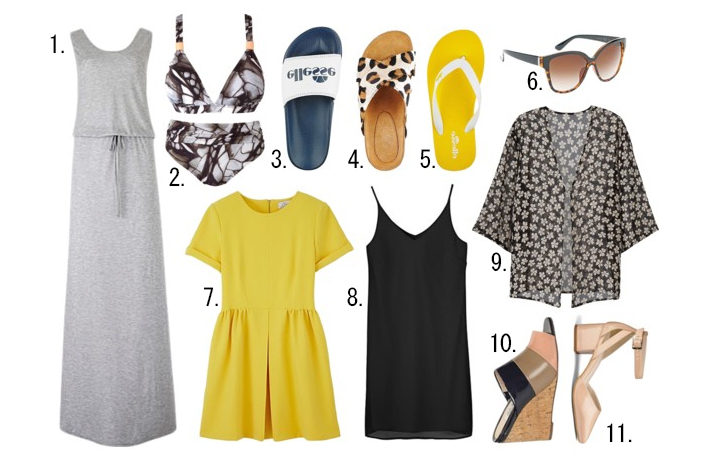 They have everything you would need for a holiday abroad, from colour-blocked wedges and pointed courts for evening, to sliders and flip flops from the likes of Ellesse and Adidas for day. If only I’d know about this before now as I’d love to have packed number 3, 4 and 5 in my holiday suitcase! Have you shopped with JD Williams before? Which items would make it to your wish list? "#BROWGOALS | BENEFIT GOOF PROOF BROW PENCIL | REVIEW"
"WHAT’S IN MY FLIGHT BAG?"